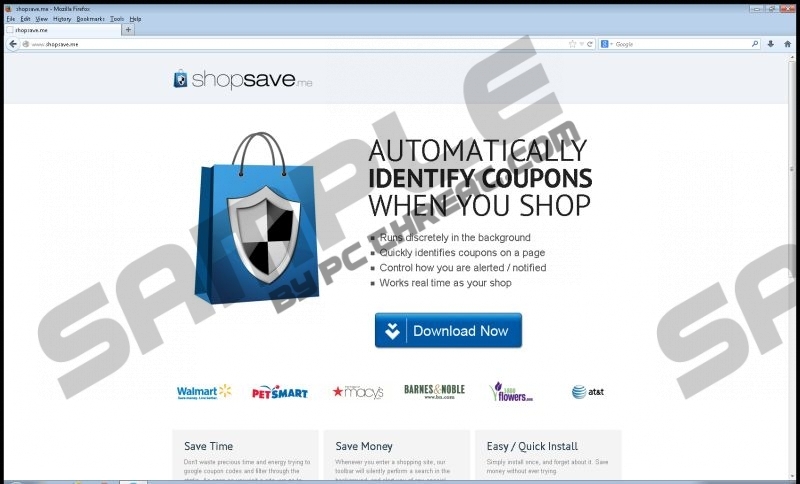 ShopSave.Me is and adware program which has its official website shopsave.me. The application run in the background and once it detects that the website that you have just accessed has some coupons, it displays them so that you can get the best online deals. ShopSave.Me is compatible with Internet Explorer, Google Chrome, and Mozilla Firefox. Your browser can get affected by this adware program at any time if software distributors decide to bundle ShopSave.Me with other programs. Hence, it is highly advisable to pay close attention to the information that you are provided with after launching the installer of a program. ShopSave.Me can inject different types of advertisements into shopping websites. ShopSave.Me advertisements include coupons, price comparison information, and pop-up advertisements. By installing the application you agree to use it at your own risk because ShopSave.Me does not govern the websites that are being advertised by ShopSave.Me ads. It means that ShopSave.Me may provide you with inappropriate advertisements. Some questionable links to third party websites may be displaying on the search engine result page. We recommend that you be very careful when browsing unreliable websites in order not to get deceived by online schemers. In order to improve the quality of the service and create new services, ShopSave.Me may monitor your Internet usage., ShopSave.Me may use browser cookies find out what your online interests and browsing patterns are. In other words, ShopSave.Me records non-personally identifiable information. The official website does not provide visitors with information on what non-personally identifiable information is, but it is very likely that it includes your search terms, clicks, browsing history, and some other Internet browsing related information. Even though a lot of adware programs are not aimed at revealing users’ identities, some personally identifiable information may be recorded by ShopSave.Me. In case you have installed ShopSave.Me by mistake and have no intention of using the application, you can either use our removal guide or implement a reputable spyware removal tool. Even though it is possible to uninstall ShopSave.Me, we recommend using SpyHunter. A reputable and powerful spyware removal program can safeguard the system against various computer threats so that you do not have to deal with Trojan horses, browser hijackers, and other threats. SpyHunter can take care of your operating system, so do not hesitate to implement this application. Move the mouse to the lower-left corner. After uninstalling the adware program, do not hesitate to scan the computer. By scanning the system you will get a chance to find out the security status of the computer, which you can easily do with the help of the scanner available below. Quick & tested solution for ShopSave.Me removal.